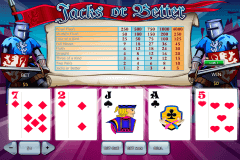 10’s or Better by Playtech is a variation of an old and beloved Tens or Better video poker type. 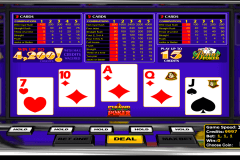 The game looks nice and simple, but the simplicity is sometimes too much in video poker games. Read below to get what we mean. So, this game has nothing unpredictable. It is played with a standard deck of 52 cards and has no wild cards implemented. It has a regular payout table and a good betting range, which offers to wager from 1 to 5 coins. It is a sort of restriction for some gamblers, but it is the way you don’t lose too much. This free video poker is played with only one hand which is a bit disappointing. To start the game you should press Deal. You are then dealt 5 cards which can be held or discarded in order to build a strong hand. Therefore, you draw new cards except for the discarded ones. The RTP here is better when playing the highest bet. 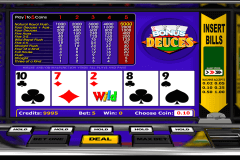 Online casino games mostly have a variety when we are talking about bonus rounds. However, it is not true about video poker. This particular free video poker has the same doubling feature. You can also double only a half of your winnings and leave the other part to your balance. This gambling round offers to guess a card with a higher value than the up-faced card. You can pick between four down-faced ones. The RNG is not high enough to make more than two attempts. The overall impression about 10’s or Better by Playtech is okay. It is definitely not the best available game but is worthy enough to play just to gain some experience. It requires no download and is easily accessible.